Family Stories · Dr. Charles Alexander Warfield, the " Annapolis Tea Party" and the "Burning of the Peggy Stewart"
Charles Alexander Warfield, son of Azel Warfield and Sarah Griffith, was one of the initial patriots in Maryland who determined the course that this country would lead in opposition to the King of England at the time of the Revolutionary War. Immediately after his death on Jan 29, 1813, his deeds were chronicled in the "Baltimore Patriot". Dr. Charles, who had received professional honors from the University of Pennsylvania and was a distinguished member of the "Whig Club", had been appointed Major of Battalion. While parading his battalion in Anne Arundel County he printed labels inscribed " Liberty and independence, or death in pursuit of it" and placed one on the hat of each man in his company. Many of the older neighbors were astonished and one approached the father of Dr. Charles and exclaimed: "My God, Mr. Warfield, what does your son Charles mean? Does he know that he has committed treason against his King and may be prosecuted for a rebel?" The father replied with much animation: "We acknowledge no King, the King is a traitor to us, and a period has arrived when we must either tamely submit to be slaves, or struggle gloriously for 'Liberty and Independence'. The King has become our enemy and we must become his. My son Charles knows what he is about. 'Liberty and Independence or death in pursuit of it' is his motto, it is mine, and soon must be the sentiment of every man in this Country". A short time later the brig "Peggy Stewart", loaded with tea, docked at the Annapolis harbor. 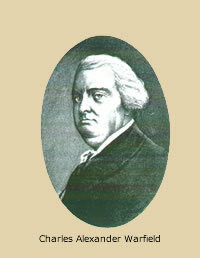 Dr. Charles, who was age 23 at the time, was determined to march to Annapolis and burn the vessel and cargo. On the way they were confronted by the ship's owner, a Scotch merchant named Anthony Stewart, who threatened them with the vengeance of the King and the government. However, the threats only increased the determination of the small group of men led by Dr. Charles. "They erected a gallows immediately in front of Mr. Stewart's house and, by way of intimidation, gave him his choice to either swing by the halter or go with them on board to put fire to his own vessel". He chose the latter and on October 19, 1774 the ship and it's cargo was consumed in flames. In a conversation with Dr. Charles before their death, Judge Chase remarked, "If we had not succeeded, Doctor, in the Revolutionary contest both of us would have been hung; you for burning the ship of tea and I for declaring I owed no allegiance to the King and signing the Declaration of Independence". In these ways, Dr. Charles Alexander Warfield and a few determined and patriotic persons moved alternately between hope and fear, until they accomplished the great hope of their lives, to give themselves and others in this country their freedom. It is through their determined and courageous acts and those after them that we remain free today.